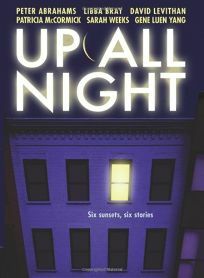 Invited by editor Laura Geringer to write about ""a single night that matters""-about a character kept up all night and transformed by his or her vigil-six authors contribute six stunning stories. Varied in form and content, these entries share a confident, assured pace; the authors know how to build characters and settings, and they do not cut corners. Abrahams, for example, begins ""Phase 2"" as a girl describes her family's preparations for her father's homecoming from the Iraq war. At the expected hour, however, it is not the father who arrives but a lieutenant and a chaplain; the girl's mother turns white, ""the color of a corpse in the movies."" This dramatic but controlled setup leads to an emotionally nuanced encounter between the grieving mother and a medium, with the narrator and her younger brother crossing the most unexpected of barriers. The other stories, including Bray's '70s-era ""Not Just for Breakfast Anymore,"" about a girl coming to terms with her father's recently announced gay identity; Patricia McCormick's ""Orange Alert,"" in which a 15-year-old short-circuits an abusive relationship; and Gene Luen Yang's graphic-novel format ""The Motherless One,"" featuring a chimp searching for ""some small sign that... someone wanted me to exist,"" are equally complex and surprising. Of special interest: the publisher is sponsoring a story contest for teens. Ages 12-up.